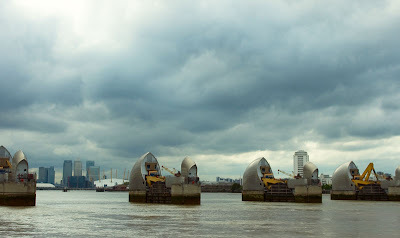 Another view of the Thames Barrier gates taken in May and just a couple of days before their 25th anniversary. During that time the gates have been closed 410 times, 296 of those were for testing. That means 114 times London needed the protection from flooding. Remember to visit other skywatchers around the world. Incredible! Those barriers look like mini cargo boats! And love the brooding sky above! Looks like the barrier might just be needed if those clouds have their way! You always get a fresh vision of every place... Have a good weekend. I love the sky in this photo, it's very dramatic, especially with the flood gates there! Nice coverage. The skies are very dramatic. Was it going to rain? Looks like the flood gates are important part of the city. Another great photo, and very evocative of London. 25 years eh? I used to work with someone who had a basement flat near the river, she would worry about flooding, especially at high tides and rain. If there was a flood warning she would seal her possessions in plastic bags so that they would float on any water and not get crushed. That sky is surreal. I have seen more blue skies on your blog than I ever did when I lived in London. Clever though, isn't it? Love the clouds--looks like the barriers are just about to be needed! impressive and surealitic shot ! The sky looks so ominous and the barriers look like soldiers waiting for battle. The gates are impressive and so is your photograph. Wonderfully composed...and the clouds set it off perfectly. A gorgeous shot in every way! Love the heavy scales of your busy summer clouds. this is a uniquely interesting skywatch! The barriers look most intriguing, sitting there, waiting to go into action. I always wondered what are they. Impressive dramatic sky too. These gates are truly amazin. I find them beautiful too. Super shot, Mo. That sky, wow. I just had to stare at the photo for a moment...amazing! I just saw a little piece of the movie "flood" and now here they are the barrier gates, with a really great sky ! Impressive! They look like galleons ready for battle just before a storm coming. Ciao. A.